Meet the folks who lead the way in our citywide network and its local branches. ﻿Becca Seely is the director of The Vine NYC campus ministry network and its parent organization, Lutheran Ministries in Higher Education. She was not raised in church and first began to explore questions of faith when she was in college. As a result, she is particularly passionate about working with young adults who are asking questions about God and what gives our lives meaning and purpose. Becca loves hearing people's stories, learning new things and discovering the unexpected ways God is working in the world around us. In her free time, she enjoys running and biking in Central Park, hanging out with her wife, Abby, and planning elaborate theme parties. Becca graduated from Yale Divinity School in 2012 with a Master of Divinity and also holds a Certificate in Advanced Theological Studies from Pacific Lutheran Theological Seminary. She is an ordained pastor in the Evangelical Lutheran Church in America. Currently, she serves students directly as co-pastor of the LaMP and PRiSM branches, and as a chaplain at New York University. Email Pastor Becca at pastor@thevinenyc.org. K serves as the co-pastor of LaMP, as well as the senior pastor of St. Paul & St. Andrew United Methodist Church. He has served that progressive congregation since 1984. He served for 15 years as a chaplain to Columbia University and is excited to be working with students on a regular basis once again. He is currently in his second term on the New York Conference Board of Ordained Ministry. He serves on the Board of Directors of West Side Campaign Against Hunger. He has taught at Drew Theological School and Union Theological Seminary. Prior to seminary, K served as a Fellow of the Council on Economic Priorities. He is passionate about interfaith work, ministry with the poor and marginalized, and the possibility of an inclusive church. He holds degrees from Cornell University (BS) and Union Theological Seminary (MDiv, STM, PhD). K is a pastor in the United Methodist Church. ﻿Barbara Davis help to lead the PRiSM community as part of her work as the Executive Minister at The First Presbyterian Church in the City of New York, where she has served for twenty years. She is graduate of Thiel College, Union Theological Seminary and Fordham University. She loves working with students, seminarians, animals and learning about people's spiritual geography. In her free time, she likes to bike, sketch, hang out with her two daughters and their two cats, take photos and visit new places. She is an ordained pastor in the United Church of Christ. 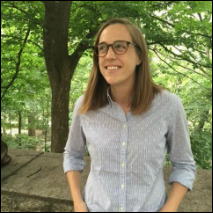 Alyssa Kaplan is a third year Master of Divinity student at Union Theological Seminary. She's currently in the middle of the ordination process in the Lutheran church. She's originally from southeastern Virginia and loves being by (and in) the water. She loves to travel and has had to opportunity to study abroad in Argentina during college, and lived in Mexico between college and seminary. She is passionate about the church's role in justice work, particularly along our nation's southern border. She is a coffee addict, cheese enthusiast, book worm and adventure seeker.